How many people check their blood pressure measurement as often as they should? Not very many. Taking this ever important vital sign is more important than most people realize. 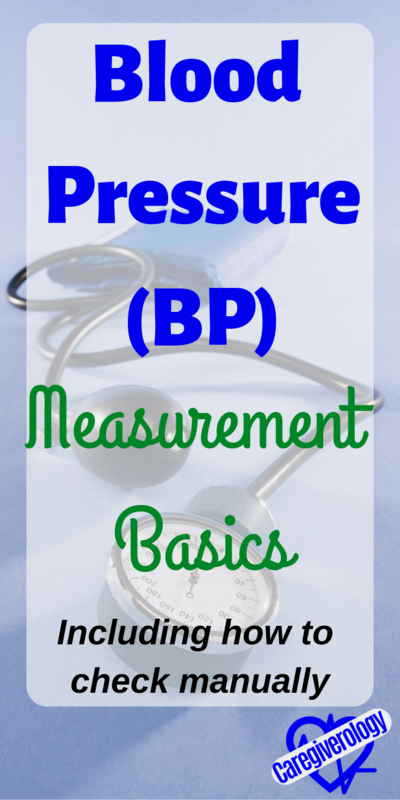 The average blood pressure (abbreviated as BP) is less than 120/80. Working at a hospital, I have noticed these measurements vary greatly from person to person. There are many people with high or low blood pressure but don't even know it. A lot of people are actually surprised when I tell them their pressure. If you have no idea what a sphygmomanometer machine is, or if you are like me and just can't pronounce it, blood pressure machine is a simpler term. It's the device that actually takes the blood pressure measurement. It automatically pumps up a blood pressure cuff and then slowly releases while it checks the pressure. Some even check while pumping for an even faster result. It didn't always used to be this easy though. 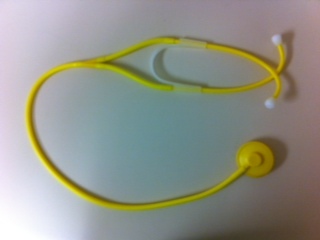 As a matter of fact, some people still use the old fashioned way where the you pump up the cuff and listen with a stethoscope as you release to check for the pressure. 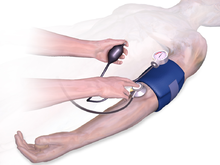 For help on this method, visit the manual blood pressure section on this page. Blood pressure cuffs vary greatly in size but generally have the same shape. 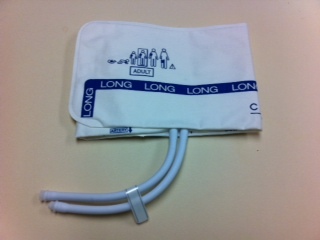 The cuff attaches to the blood pressure meter and then they work together to acquire the result. The cuff will have a tiny arrow at one end. That arrow should point directly to the brachial artery which is the large artery at the bend of the elbow. If it is not visible, try to feel for it. 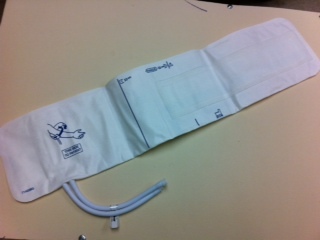 Before you begin, make sure you have the right size blood pressure cuff. This can be a little tricky, but don't brush it off as unimportant because with the incorrect size, the reading could be completely wrong. Luckily, there are many different sizes to choose from. From sizes small enough for newborns all the way to ones large enough to wrap around an adult's thigh, no arm is too big or small. Make sure the cuff is large enough to wrap snugly around the patient's arm leaving about an inch from the elbow and another inch from the armpit. If there isn't an inch from those two things, you may need to get a different size. For wider arms, there is usually a "long" option for different sizes. It should be long enough for the velcro to stick to itself completely. 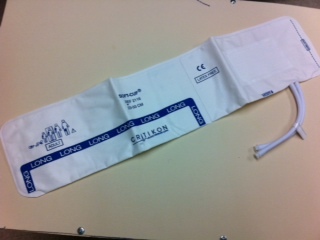 If there isn't enough velcro sticking together, inflating the cuff will result in it coming undone. Once in place, press the start button on the blood pressure meter and within a minute or two, sometimes faster depending on the machine, you will have an accurate blood pressure. The reading will be two numbers. The first one is called the systolic and the second one is called the diastolic. For example: For the reading 110/70, 110 is the systolic and 70 is the diastolic. Normal blood pressure (average) is systolic less than 120 and diastolic less than 80. Elevated (prehypertension) is systolic between 120-129 and diastolic less than 80. Stage 2 hypertension is systolic 140 or higher and diastolic 90 or higher. Hypertensive crisis is systolic higher than 180 and diastolic higher than 120. If the systolic is greater than 150 or less than 100, the certified nursing assistant (CNA) is often supposed to notify the registered nurse (RN) for that patient. Similarly, they also notify the nurse if the diastolic is more than 90 or less than 50. This just gives you an idea of what is acceptable in most situations. If the blood pressure measurement is out of those ranges, recheck it, preferably on the other arm. If you are unable to check it on the other arm, just take off the cuff and reposition it again. Make sure all of the excess air is pushed out of the cuff before rechecking. A lot of times with my patients, one arm has an IV site at the bend of the elbow (never check it in this arm), and the other one is broken or restricted for some other reason. In cases like these, a leg is the only option. The thigh and the calf are both acceptable but usually the calf is the best option because the thigh usually takes quite a large cuff. I've noticed the blood pressure measurement is slightly higher in the leg than it would be in the arm. It is best to check the blood pressure measurement when the patient is sitting or laying down in a relaxed state for at least 10-15 minutes. For some people, especially the elderly, getting up to go to the bathroom is enough to send a pressure through the roof. If a patient is really excited, stressed out, or in a lot of pain, it is usually best to try and wait until these things have settled if you want the best pressure possible. 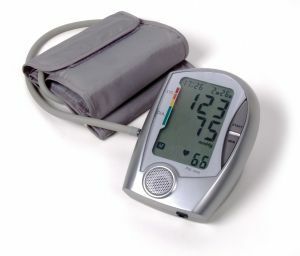 Blood pressure meters are highly sensitive and the slightest movement can throw it way off. Make sure the patient doesn't move around or talk while their pressure is being taken. If they do, simply remind them to relax while it is being taken and check it again. 1. Wrap the cuff around the arm with the arrow pointing towards the brachial artery. This is the large artery located at the bend of the elbow. It is often visible but if it isn't, try to feel for it. 2. If the sphygmomanometer isn't already attached to the cuff, go ahead and attach it. Make sure the valve is completely closed by twisting the knob clockwise until it stops. 3. Place the earpieces of the stethoscope in your ears and the bell end directly on the brachial artery where the arrow is pointing. 4. Use the bulb to pump up the cuff until the needle reaches 160 mm Hg. If you immediately hear thumping sounds, keep pumping up the cuff until you don't hear anything. 5. Very slowly and gently twist the knob counterclockwise which will cause the needle to drop. Try to release pressure at a slow and steady 3 mm per second. 6. Once you hear the first thumping sound, at that very moment, whatever number the needle is on is the systolic, or top number, of the blood pressure. 7. Keep listening until the thumping sound slowly fades away. Immediately after you can't hear anything anymore, look at the number the needle is on. That number is the diastolic, or bottom number, of the blood pressure. So simply put, wherever the needle is when the thumping sound begins is the top number (systolic) of a manual blood pressure and when the thumping ends is the bottom number (diastolic). Abnormal blood pressure can cause permanent damage if not taken care of. It is best for you, and everybody else you know to get it checked now before it gets out of hand. Help is available, but you have to first find out if your pressure is where it shouldn't be. Even if it is normal now, that doesn't mean it always will be. Check it regularly no matter how healthy you (or your patient) are. Our bodies are constantly changing. A trip to the doctor or in extreme cases, the emergency room may be necessary if it can't be controlled on your own.